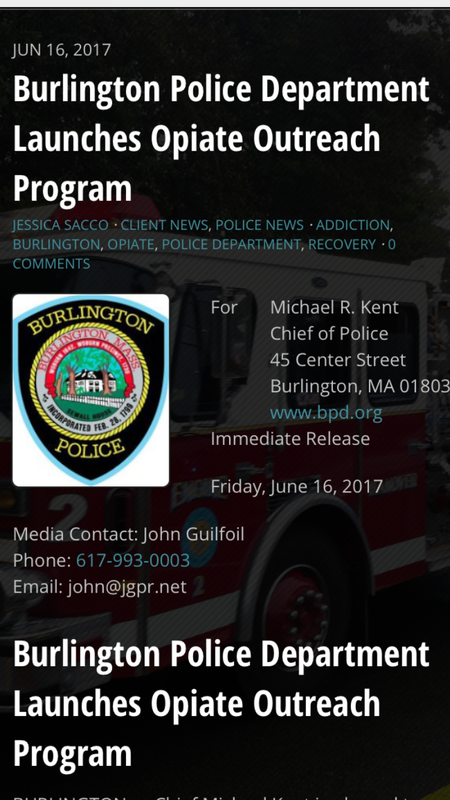 BURLINGTON — Chief Michael Kent is pleased to announce that the Burlington Police Department has launched its Opiate Outreach Program to help those beginning the process of recovering from addiction. A few months ago, police learned that longtime resident and recovery specialist Christine Cuccinello — who is in recovery from an opiate addiction and is pursuing a career as a recovery coach — was looking to help residents struggling with addiction. Working with Cuccinello, Burlington Police secured a location for weekly meetings to occur. Their focus will be to help residents recover from an opiate or alcohol addiction and/or assist those who have family members or loved ones in need of help and recovery resources. The first meeting will be held on Tuesday, June 27, from 7-8 p.m. at St. Margaret’s Church Religious Education Building, 111 Winn St., Burlington. Cuccinello will lead the meetings and no police officers will be present, unless specifically invited by participants. The Burlington Police Department believes it is important to offer a service that can provide people assistance before law enforcement may become involved. All meetings will remain anonymous. For more information about the program, contact Cuccinello at christinec0507@gmail.com or 857-258-9708.